Reports of bigfeet also show that they are different colors in different parts of the country. The ones way up in Canada and Alaska are a lighter color of brown or even gray while the ones down south are darker brown or black. Coming home from Alaska where I worked a few years on the pipeline I moved in with my father who had taken over a ranch in Oregon out in the woods. The house had been empty for a few years and the out buildings needed work. It was a foggy morning and i was at the kitchen window with the light on. I noticed what looked like a broken off grey tree trunk just visable in the fog. I had not noticed it before but i was new to the place and did not have it down as to what was where around the house. staring at the tree trunk which was about 8-9ft high it moved. Turning side ways I noted it ad a huge chest and stomach area It took off running down to the creek with its forearms held parallel to the ground. It was really big and later I determined it was hanging around an old apple tree. Some time later being alone over night I wa woke up by a strange howl and coming out my sleep i thought a large ape had escaped from a zoo. the dogs also woke up and started barking chasing off what ever it was. Years later I heard way up the valley where I live a roar like you would hear in Africa. it echoed. i let that one go uninvestigated. It was impressive. Aaron had this on his facebook wall. I see he did not post it here.... Aaron hope you don't mind me sharing this video. Didn't know we're supposed to have 'em in Florida! A bigfoot’s howl is multidimensional: a deep and undulating whoop that starts low and ends in a high, feral squeal or resolves completely, like a siren. The first time I unleashed one, while crouching on a bluff overlooking the eastern bank of the Apalachicola River, Matt Moneymaker — who, moments earlier, had loosed a robust, commanding shriek that echoed through the valley — responded with a hearty guffaw. “I have a cold,” I mumbled by way of an excuse. It was almost 2 a.m., and we were huddled in the dark in Torreya State Park near Bristol, in the Florida panhandle. My craggy, toadlike holler yielded no response. Moneymaker is the founder and president of the Bigfoot Field Researchers Organization (bfro.net), a group of Bigfoot investigators dedicated to acquiring “conclusive documentation of the species’ existence.” Bigfoots, also known as sasquatches or yetis, are famously elusive — if they exist at all. Since 2000, the organization has hosted research expeditions — including some open to nonmembers — to suspected Bigfoot habitats across North America. The goal is to rouse and record a Bigfoot. The trips — which typically last four days and cost $300 to $500 (not including airfare, camping equipment or food) — are led by an investigator affiliated with the Bigfoot organization who is native to the region. They center on nightly jaunts through the woods. Now, 11 of us — three women and eight men, including Craig — had assembled with hopes of repeating his encounter. I was dubious but also willing to accept that I didn’t know what oddball creatures might be loping around the forest late at night. The Bigfoot organization’s online database contains more than 30,000 user-submitted Bigfoot reports, and it’s a surprisingly consistent body of data: By most accounts, adult sasquatches weigh about 650 pounds and are 7 feet to 10 feet tall. They are nocturnal; fond of women and packaged sweets; hairy; bipedal; omnivorous; flat-footed; and malodorous. On the organization’s expeditions, faith in the existence of Bigfoots is presumed, and the hunts proceed with a grim earnestness. Members are accustomed to incredulity: Detractors — including most reputable scientists — insist that all observed phenomena could easily be attributed to a bear, a rogue primate or a guy in a gorilla suit. Moneymaker and Barackman co-star on the Animal Planet series Finding Bigfoot, in which they amble through dark thickets, howling at each other and banging blocks of wood together (sasquatches purportedly communicate via “knocking” — the belligerent pounding of trees or their own bodies). At 10:30 p.m., after we had roasted hot dogs and exchanged a couple of squatching yarns, Moneymaker ran through a few rules. “Don’t freak out” was the prevailing theme. He said he had seen otherwise-stoic men — soldiers, even — turn into “sniveling messes” when led into a dark forest. Moneymaker distributed night-vision monoculars called Ghost Hunters, which render everything in shades of green. We split into two groups, putting enough distance between us that we could initiate and return calls. We hoped to hear a few knock backs right away. Our group of five crept toward the river in a single line. We paused near the sight of Craig’s encounter and, after radioing Barackman’s team, tried a few howls. Much of Bigfooting is listening, and, like any kind of hunting, it requires extraordinary patience. While we waited for a reply, I pulled a Reese’s Peanut Butter Cup out of my back pocket and laid it on the ground. A foraging armadillo let out a few inquisitive grunts, but sasquatches, it seemed, were uninterested in initiating contact just yet. Eventually, we trekked back to camp and reorganized. About 3 a.m., I followed Barackman and four others east toward the park’s sandy access roads. We howled, knocked and scanned for glowing eyes, but our solicitations were not reciprocated. By 4:30 a.m., I was asleep in my tent with my hiking boots still on. i wouldn't mind going on one of those expeditions. I've been out hunting bigfeets by myself but never with an organized bigfoot expedition. It might be kind of interesting to see what turns up. 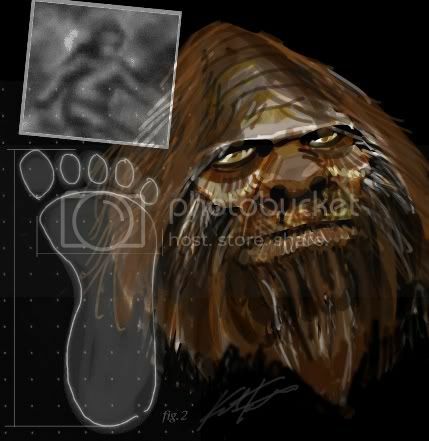 An artist's interpretation of Bigfoot. A new university-backed project aims to investigate cryptic species such as the yeti whose existence is unproven, through genetic testing. Researchers from Oxford University and the Lausanne Museum of Zoology are asking anyone with a collection of cryptozoological material to submit descriptions of it. The researchers will then ask for hair and other samples for genetic identification. "I'm challenging and inviting the cryptozoologists to come up with the evidence instead of complaining that science is rejecting what they have to say," said geneticist Bryan Sykes of the University of Oxford. While Sykes doesn't expect to find solid evidence of a yeti or Bigfoot monster, he says he is keeping an open mind and hopes to identify perhaps 20 of the suspect samples. Along the way, he'd be happy if he found some unknown species. The story of a big hairy monster of the Himalayas stomped into popular culture in 1951, when British mountaineer Eric Shipton returned from a Mount Everest expedition with photographs of giant footprints in the snow. The cryptic creature goes by many names in many places: yeti or migoi in the Himalayas, Bigfoot or sasquatch in the United States and Canada, respectively; almasty in the Caucasus Mountains; orang pendek in Sumatra. And while reports of such creatures have abounded around the world since then, there is no real proof they exist; the reports inevitably turn out to be of a civet, bear or other known beast. Sykes doesn't want to start receiving loads of skin, hair and other samples haphazardly, so he is asking people to send detailed descriptions of their "yeti" samples. Once he and his colleagues have looked over the details — including physical descriptions of the sample (even photographs), its origin and ideas about the likely species it belongs to — they will send a sampling kit for those that are deemed suitable for study. "As an academic I have certain reservations about entering this field, but I think using genetic analysis is entirely objective; it can't be falsified," Sykes said. "So I don't have to put myself into the position of either believing or disbelieving these creatures." One theory about the yeti is that it belongs to small relic populations of other hominids, such as Neanderthals or Denisovans. While Sykes said this idea is unlikely to be proven true, "if you don't look, you won't find it." The collection phase of the project will run through September, with genetic testing following that through November. After that, Sykes said, they will write up the results for publication in a peer-reviewed scientific journal; this would be the first such publication of cryptozoology results, he said. I'm going to guess that was a fake. The way the thing was running was a little too human and it's legs seemed a little too baggy, especially down around the ankles...kind of like somebody was wearing a gorilla suit. Also the fact that the guy immediately turned around and took off in the opposite direction makes me suspicious. If I saw a bigfoot run in front of me I wouldn't turn around and drive away. I might have to change my underwear but I would definitely stay and get a closer look at the thing. Check this photo out. It was supposedly taken by a trapper up in Alberta, Canada. Skeptics are claiming it is the backside of a bear with a cub but I don't see how that thing can be a bear. The arm is way too long. What do y'all think? It has the classic shape of a bigfoot. The arms appears to be right and the head is right...so is the broad back and big shoulders. I wonder why the guy only took one picture though? And why is it that we only get to see the back of these critters? 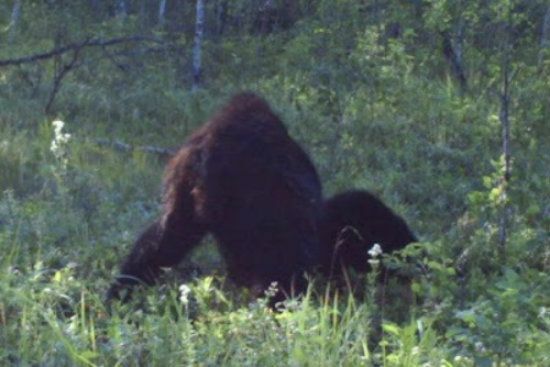 That picture I posted a while back that was supposedly taken down south by a trail cam also showed the creature's back. Why don't we ever see an up close picture of the face and front? That doesn't look like a bear to me either. I've seen bears before and that's not one. The guy probably only took one picture cuz he didn't want to get ate up. I sure wouldn't want to get ate up by a bigfoot! Is that the book Shami keeps asking about? She keeps saying she read a book where Bigfoot came out of a UFO with some kind of a purple cube or pyramid or something. I had no idea what book it was. Not a bear. Maybe a bigfoot and offspring to the side. If one saw something like this it and one was BEHIND IT it would be very hard to get in FRONT OF IT to get a frontal shot. Unless you got its attention and it turned around. Which might be a scary plan for the person. IMO. That's true. I doubt that the guy would have wanted to try either. He probably wanted to get home as soon as possible so he could change his underwear. I don't see how anybody can say that thing is a bear. The shape is totally wrong. The head is wrong and the arm is way too long. The closest living animal I could suggest to it is a gorilla but it doesn't look like that either. The photo was supposedly taken in Canada. Can Paulette or Lorelei confirm if the plants in the photo are similar to what grows up there in the summer? Re vegetation: It looks high altitude or alpine but too blurry for me to say. Bigfoot hunters gather in Morehead, Ky.
A slide shown from the Bigfoot event in Morehead Saturday featured a forensic sketch of a witness's description of a sasquatch reportedly seen on April 24 near DuBois, Pa.
MOREHEAD — Eastern Kentucky is known for its hunting possibilities — deer, turkey, elk and even black bears. But Bigfoot? Not so much. That might be changing, however, as the second Bigfoot hunt in less than five months was scheduled for Saturday night in the Daniel Boone National Forest near Cave Run Lake. These particular hunters were armed with nothing more lethal than infrared cameras and laser pointers. About 50 registrants paid $75 apiece to attend the event, which included afternoon lectures and presentations at the Hampton Inn in Morehead. Paranormal researcher Chad Morin said he paid $150 for a permit from the U.S. Forest Service for the night hunt, which was to last until 2 a.m. Sunday. He said the document reads "Permit to hunt Bigfoot." Morin hosted another Bigfoot hunt April 21 near Morehead. "We saw so much weird stuff we had to make a second run," he said. Morin showed the audience an infrared-camera video taken in April that showed an indistinct "heat signature" of ... something. One of the hunters directed a laser pointer at the object, but it didn't move, Morin said. "Now, think about this," Morin told the audience. "If you're a person in the woods, and there's a huge group of people pointing laser pointers at you in the middle of the night — we're the scary ones now, you know what I'm saying? But the object doesn't move at all. It's just standing there." Charlie Raymond, founder of the Kentucky Bigfoot Research Organization, said the group has received more than 230 reports of sightings since its founding in 1998. "We meet the witnesses in person, so we validate that they're credible as best we can," Raymond said. Re: photo above. After looking at it for awhile - I think it is two gorillas. And there is something wonky about the body/bodies. If you look carefully at the supposed back on the right side, it looks like a tiny version of the outline of the thing's head and shoulders. Anatomically speaking, it looks wrong - like they used some blackish pixels to fix or fill in a space. It does look kind of weird. That arm on the left (if it is an arm) is huge, even for a bigfoot. And where are the legs? Even if it was sitting in thick grass and weeds there should be some legs visible somewhere, and if the grass was that thick what is the arm resting on? It could be a fake. Perhaps the guy made a fake bigfoot and draped a bearskin over it? I'm going to reserve judgement on this one and wait for a better photo that actually shows the front of the darned animal instead of just a mountain of fur. THANK YOU. I been putting this topic on the forums we been on for years. 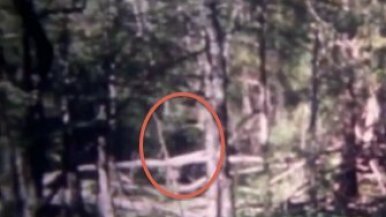 That book I read about a rancher being terrorized by ufos on his property stated he watched as bigfoot in the woods came out of a landed saucer. He was carrying a purple box which gave off light. The bigfoot set it down in the clearing as it watched from the trees. This light seem to get brighter. The rancher was so scared he fled down the mountain in his Jeep. I believed this book I read. One would have to read it themselves and I don't know the name of it now. It was either Wyoming Utah or Colorado. It was long before anyone even heard of the Skinwalker Ranch. In fact it was right after my close encounter in 72. The state police never found a thing. Of course not..
Also in this book the ufos buzzed his home on a regular basis. It caused so many problems as he never knew when he was going to loose his electrical power. Once even, he had the TV unplugged an a darn ship right above the house turn the TV back on. There is a photo in the book with him and the authorities at his TV, guess he was showing them where it was in his home and the wall outlet..
Would love to remember more in this book . 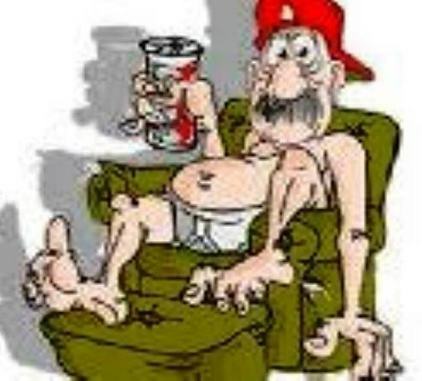 They took him one night while his wife was standing on the front porch watching the event unfold. Suddenly she was hit by a blue beam and could not move, but she still could seen the ship and heard her husband out in the yard. It was hours later they brought him back and she was laying on the porch like she had fainted. Now the Sheriff really thought they were crazy. He said he had to get this out to the public. I'm not sure if he was the author or some journalist he told all his experiences to. . He looked about 35 when I was 31 years old . I do not know if it was a new book. As I rented it from the library. In fact I checked it out a number of times then it finally was not returned by someone who had checked it out. This is how I discovered the book Communion .. Budd Hopkins.. Intruders. from my library. They keep up with this subject. Anything I see on the net that has been written about ufos always comes in. I knew Alien Mind would find its way there and it did. Oh yes. I don't think there would be photos of the Sheriff in his living room if something was not going on there. Then when two men from here seen a bigfoot in a grove south out town .. that confirmed it for me. As there's no way a bigfoot entered this area with out being seen. He would of been seen by hundreds . The two bigfoot Father and Son witnessed happened twice to them but the first time they were afraid of ridicule. The second time they went to our dally newspaper. And dd the story bring a lot researchers here. I told my husband . I won't be going to the Grove anymore. The fall colors are when most people go there. There is a church. A dance hall my brother played at was there and we went a lot to that. They hold Native American Pow Wow's there. Funks corn is still here today. He was the original land owner. There is photos at the end of this link. Darn home page won't load for me .. if you it did not load for you . try the table of contents .. Go to Illinois, It is the second story. The link brought up a video of a racing skateboarder being hit by a deer.